In 1926, C.T. Snidow, unaware of the site’s history, purchased the land and opened the amusement park. The park featured a spring fed swimming pool, dance hall, occasional Wild West shows, carnival rides, water rides, a racetrack, concession stands, and cabins for guests to stay in. It became a popular summertime retreat for thousands of coalfield families. It closed in 1966 after experiencing two troubling children’s deaths over the years. The first mysterious death, which has been confirmed by the owners, was of a young boy, who drowned while the swimming pool was still open. A mother dropped her child off at the park one morning to return that afternoon to find that her child was nowhere to be found. After searching the entire grounds, she found her child's lifeless body floating in the pool. The owners filled the preexisting pool with sand to prevent any further accidents. The second death occurred in the children’s playground where a swing set was located, and when in operation revolved at a high rate of speed. One day in the early 1950s a truck delivering soda to a refreshment stand accidentally backed up into the path of the swings, and a young girl was killed when she was struck by the truck. 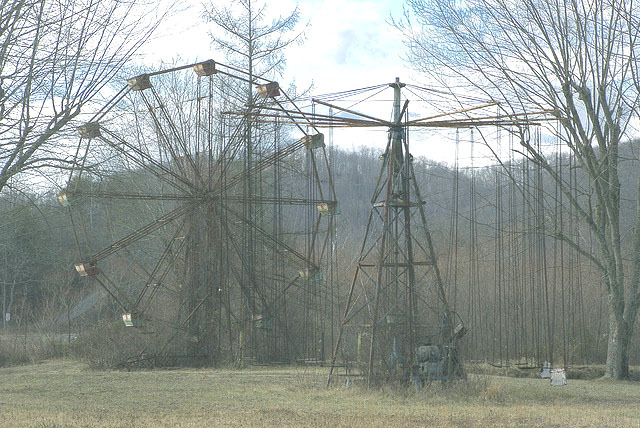 Abandoned rides at Lake Shawne. The girl was killed on the circle swing. Lake Shawnee owner Gaylord White, who worked at the park as a youth , bought the long-vacant amusement park in 1985. He planned to subdivide the land and sell residential lots. However, after White began finding Native American burial sites and numerous artifacts, he put the idea of selling the property for homes to be built on the graves to rest. Instead he reopened the amusement park that year, but it only lasted three years. The skeleton of the Ferris Wheel, several abandoned rides and the children’s swings are still on the park grounds. While the two deaths could be written off as unfortunate accidents, the park has been the scene of much paranormal activity; in short it is haunted. Of the paranormal activity that has been observed at Lake Shawnee, most individuals have experienced orbs in photographs, disembodied voices, Native American chanting, unexplained sounds, and the long forgotten carnival rides moving on their own. Others who have visited the location say that the Ferris wheel is the home of a full apparition of a male subject in the car in the nine o'clock position. The swings still on the property feature cold spots just above the deteriorated wooden seats. The seats are also said to move on their own, which has been observed from across the park by visitors. Gaylord White, who worked at the park during his younger days, said he always had a feeling of someone behind him touching his shoulder or his arm. He also had unexplained feelings of a presence during his tenure there as well.His main experience occurred while he was on his tractor clearing the brush from the field after he had purchased the property. He saw the full apparition of a young girl in a pink dress with ruffled sleeves. He believes that this girl is the spirit of a girl who was killed on the rotating swing ride in the early 1950s. Gaylord parked the tractor and left it there for the young girl since she seemed to like watching the tractor so much. He has also reported hearing what he explains as sounding like chanting on the property as well. In October 2005, the park gained national attention due to the filming of ABC network's Scariest Places on Earth. During their time there, a psychic that was under contract by the network, refused to stay on the property due to the "spiritual energy being too strong." Also, film crew workers would not enter the filming location alone at night due to eerie feelings. According to archaeologists, the area around Lake Shawnee was home to at least two separate Native American settlements before European settlers arrived. The Marshall and Concord Colleges joint dig in 1988 found that the Indian settlements were circular in arrangement and the Indians lived there for long periods of time. They think the settlement was abandoned several hundred years before the first white settlers arrived. They found 13 skeletons, mostly of young children. There may be as many as 3000 bodies of Native Americans buried on the property. Historic marker about Indian attack at farmstead. 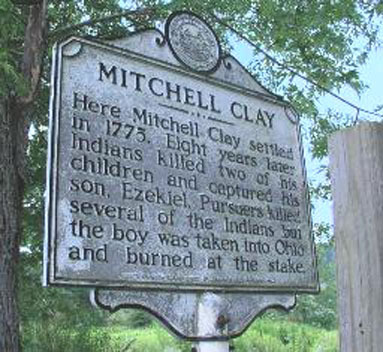 The first European settler to arrive was Mitchell Clay in 1775. He and his family lived and farmed on the property that now holds the abandoned amusement park. Most sources say that in 1783 two of the Clay children, Bartley and Tabitha, were killed by the Native Americans in the area while the men were away hunting. Bartley Clay was killed and scalped by the Native Americans, who killed Tabitha Clay as well when she tried to fight them to save her brother. Ezekiel Clay, their little brother, was then kidnapped by the Indians. When the men returned from hunting to find two children dead and one missing, they took off after the Native Americans to attempt and reclaim their son before anything happened to him. Ezekiel was taken to Ohio by the tribesmen and burned at the stake shortly before his father and the rest of the search party caught up to the Indians. When their search party defeated the Native Americans in Ohio, they took strips of skin from the decedents backs to use as razor straps. These morbid trophies stayed in the family for years afterward. The chief of the tribe in Ohio allowed Clay to claim his son's body and return him home to be buried. The first two children that were killed were exhumed and moved to the hill behind where the farmhouse stood to be buried in shallow graves with their brother.